Whenever anyone mentions an underdog, the first person to come to mind is Rocky Balboa, the punching bag turned boxing legend in the “Rocky” franchise. One movie turned into eight movies, culminating in “Creed II,” out recently, which focuses on Adonis Creed, son of Rocky’s original opponent, facing off against Victor Drago, the son of the man who killed Adonis’ father. So how do the movies stack up? Let’s find out. #1: “Rocky 1.” In the film, Balboa is an overlooked boxer that is derided by his contemporaries and even his trainer, Mickey. While Balboa is looking to increase his standing, heavyweight champion Apollo Creed is looking for a challenger after the number one contender got injured. As fate would have it, Apollo discovers Balboa, “The Italian Stallion,” and states he will knock Balboa out in three rounds. Instead, Balboa knocks Apollo down in the first round, which forecasts a long fight. In the end, despite going the distance, Apollo beats Balboa. Though the ending wasn’t expected, the movie resonates with many fans who see themselves in Balboa, an underdog who beat the odds through sheer will and determination. #2: “Creed” The first in the series not to feature Stallone as the lead, Michael B. Jordan takes the reins as Adonis Creed, the son of Apollo. In “Creed,” Adonis goes through the movie longing for acceptance from his deceased father, to show that he wasn’t a mistake. Additionally, Balboa is in his most vulnerable state: He has cancer. Instead of fighting, he accepts death. Director Ryan Coogler does a phenomenal job showing a side of Balboa that viewers had never seen before as well as introducing the new face of the franchise. 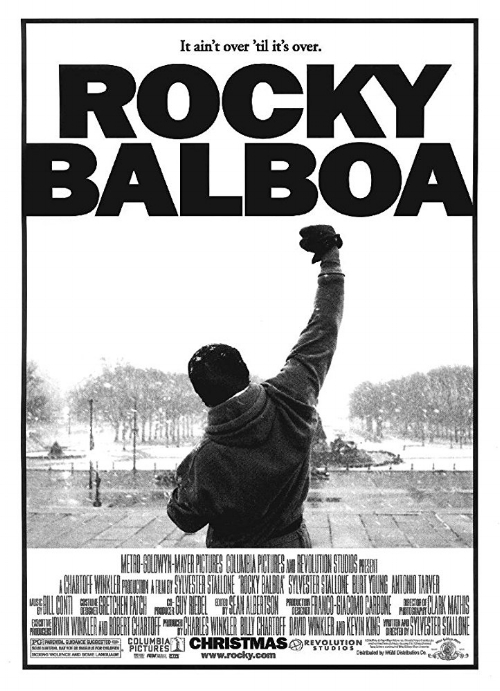 #3: “Rocky II.” This time, it’s a victory for the underdog. Taking place minutes after the fight between Apollo and Balboa, “Rocky II” focuses on Apollo and Balboa’s journey to get back to the ring. When it comes time for the fight, Balboa is manhandled by Apollo until the final round. Though leading in points, Apollo’s hubris gets the better of him. He attempts to knock out Balboa against his trainer’s wishes. Instead, Apollo and Balboa knock each other down. With the count at nine, only Balboa is able to fully stand, making him the new champion. #4: “Rocky Balboa.” Released in 2006, this iteration has a much older Balboa facing off against the new champion, Mason Dixon, the new heavyweight champion that pundits and purists’ alike have no respect for. Credit: Courtesy of MGM Distribution Co. Revolving around Balboa and Dixon’s fight, this film showcases how much Balboa has aged and that he’s no longer the fighter he once was. Though Dixon is much faster than Balboa, Balboa’s relentless nature and years of experience pay dividends as he is able to match Dixon using his iron jaw and more powerful punches. In the end, Dixon defeats Balboa, but Balboa proves to everyone that he could stay strong and continue to move forward, regardless of what life threw at him. This is a message that echoes for fans since they may see this as an inspiration in their own lives. #5: “Rocky IV,”: The cheesiest of the series. Set during the height of the Cold War, this installment sees Balboa facing off against Ivan Drago, a genetically modified fighter from the Soviet Union. The fight is significant considering Drago killed Apollo in a match. Rocky could have prevented this by stopping the match when it became clear that Apollo was in a bad state. Overcome with guilt, Balboa travels to the Soviet Union and ultimately defeats Drago. What makes this the cheesiest film is the fact that during some scenes, Balboa and Drago perform near-superhuman feats of strength. For example, Drago punches a bag and almost destroys it while Balboa is able to run in the Siberian wilderness for hours on end. Normally, I would be able to suspend my disbelief. This time, it was too much. #6: “Rocky III.” Set a few years after “Rocky II,” Balboa faces a new opponent: the brash and extremely outspoken Clubber Lang. Before the climax, Lang shoves Mickey, who has a heart attack and dies as a result. Balboa, distraught and without a trainer, gets an offer from Apollo to join forces in order to defeat Lang. Balboa eventually beats Lang. However, this film is more recognizable for its theme song,“ Eye of the Tiger” by Survivor, than its plot. #7: “Rocky V.” In the film, Balboa trains Tommy Gunn, who is keen on becoming a top contender for the heavyweight title. After the winning the title, Gunn is portrayed by the media as a phony champion, arguing that because he hadn’t defeated Balboa, he wasn’t a real champion. Gunn, on a mission to prove that he’s legitimate, challenges Balboa to a match. At first Balboa is hesitant to fight Gunn. However, Gunn attacks Paulie, Balboa’s friend. Balboa relents but wants a street fight in order to use his street fighting knowledge. Gunn accepts defeat and is taken away by police. Failing at the box office, “Rocky V” left a sour taste in fans’ mouths for the poor storyline and a seemingly disappointing end (at the time) to one of cinema’s most iconic characters. As a whole, the “Rocky” franchise has landed more hits than misses. If the trend continues, expect “Creed II” to be a hit instead of a whiff.